petition: Citizens Demand Increased Funding to BC's public schools! We Stand with the Standing Committee! Citizens Demand Increased Funding to BC's public schools! We Stand with the Standing Committee! recipient: The Liberal Government must respect the recommendations of the Select Standing Committee! Last fall the British Columbia Government asked for - and received - significant public consultation, and citizens indicated that, once again, education is their top priority. 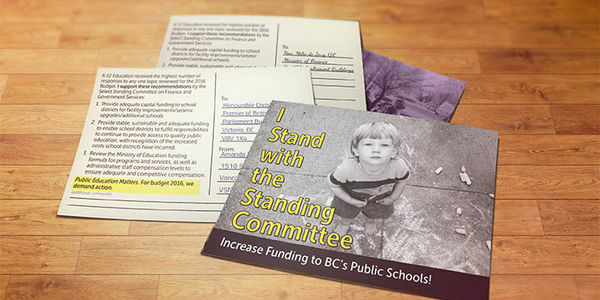 The Parent Advocacy Network(PAN), in conjunction with Families Against Cuts to Education (FACE), is targeting the provincial government with a goal to deliver hundreds of paper postcards and thousands of online signatures from citizens declaring “I Stand with the Standing Committee”. Sign NOW to "Stand with the Standing Committee"! The Government must increase Funding to BC's public schools! Consultations held by the Select Standing Committee on Finance and Government Services indicate that a well-funded public education system is a top priority for British Columbians. In their Report on Budget 2016 Consultations, the Committee noted that current funding levels and assistance are inadequate, which is causing significant operational and program delivery problems in schools throughout B.C. Submissions including recommendations for K-12 education constituted a significant portion of the public input on Budget 2016, with the highest overall number of submissions received for a single topic. Respondents allocated K-12 education a combined average of 22 cents out of every dollar, a joint outcome shared only with health spending. According to the results of this survey, no other area of expense exceeded K-12 education as a spending priority. With one third of written submissions highlighting a K-12 education-related recommendation, this is clearly an area of focus for many British Columbians. Three main recommendations are made for this sector. First, the Committee recommends that government ensure sufficient and timely capital funding to provide for facility improvements, seismic upgrades and also to facilitate the building of new schools in areas that are struggling to cope with increasing student numbers. The Committee ascertains that additional funding is necessary to ensure the provision of quality public education and to properly meet the increased costs that schools are currently facing. Finally, the Committee recommends a review of the Ministry of Education funding formula relating to programs, services and administrative staffing compensation, to ensure this sector is properly supported. By properly investing in this sector, the Committee suggests that economic and community goals have a better chance of being realized. The urgent concerns of British Columbians are reflected in these recommendations and should be addressed NOW at a time when the B.C. government is proudly reporting a surplus of $277 million. Citizens now demand increased funding to BC's public schools. We Stand with the Standing Committee! Less than 1 week to Budget 2016! Our signatures can make a difference. Please keep sharing the petition through your networks and schools and let's "Stand with the Standing Committee"! Only 10 Days left to sign our petition before Budget 2016 to demand the BC Government make Education the #1 priority again. Sign and "Stand with the Standing Committee!" Please keep sharing the survey! PAN and FACE and BC citizens thank you! Keep sharing the Petition as far and wide as you can! BC Budget 2016 deadline is Feb 16 and we need all the signatures we can get from citizens in BC! Join PAN and parents at 10am on Tues Jan 26 as we deliver all our online signatures and signed postcards Christy Clark's Vancouver office at Canada Place to demand better funding for public schools. If you are local, we NEED YOUR SUPPORT AND ATTENDANCE! And keep sharing and signing the petition - we are over 470 now and we need many more parents to "Stand with the Standing Committee."